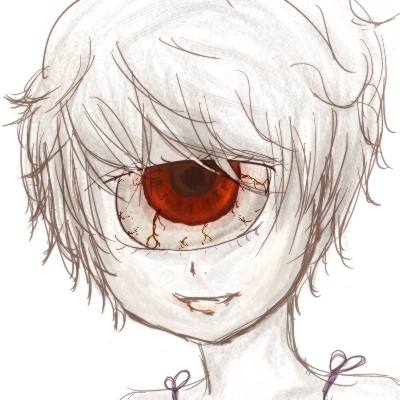 The Mono Eye (モノアイ) effect turns Sabitsuki into a cyclops with a big red eye. Like many other effects, it is entirely cosmetic and does not give Sabitsuki any powers. The Mono Eye effect is found in the Mouth and Eyes World by touching the pillar with an eye at its base that is between two ghosts (one with an eye and one with a mouth). Go northeast of the entrance, and you should pass two grinning monster looking things. Go past them by continuing going northeast and you should find the effect as the two ghosts near the pillar with an eye at the base. Pressing the action button will cause Sabitsuki to blink. If you activate the blinking effect in the apartments room with the big bleeding eye wall painting, the eye will blink at the same time as Sabitsuki.